This graphic organizer prompts students to deconstruct the purpose, style, and effect of a satirical text. Students are asked to discern the difference between the author and persona, and explain the text's purpose to a particular audience. Students are also prompted to identify stylistic strategies and explain their intended effect. 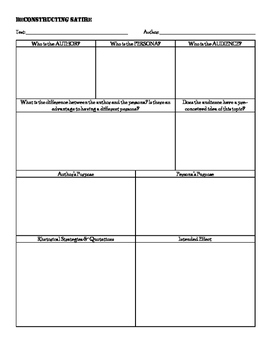 The visually organized and easy-to-follow graphic organizer is great for high school students in college prep, advanced, or EL classes. I have used this handout with AP students and EL students -- while I modify the text, the steps to analyze the text remain the same.